NBA 2K12 launched last year with a slew of online problems, disconnects, failures to connect and outright crashes, practically all of it tied to a decision to rewrite the game's old online codebase, which dated back to the game's Dreamcast origins and was an agonizing blemish even on a consensus game-of-the-year like NBA 2K12. In a detailed debriefing of the situation with Kotaku, Jeff Thomas, the director of development at Visual Concepts, the studio making NBA 2K, acknowledged that the team had strongly considered offering a multiplayer beta. The constraints of an annual development schedule made that unworkable though. Well, they're going through with it, in a way, when the NBA 2K13 demo releases on Tuesday. It will contain quickmatch multiplayer, and it assuredly will be a barometer for a game widely expected to contend for GOTY honors in the sports genre. In sports, reliable online multiplayer, like it or not, has been found only in EA Sports' stable of titles. (It was one of three areas NBA Live felt it could challenge NBA 2K in, before that adventure went into total eclipse over the summer and will be a digital-only release, if it releases.) THQ had major problems in WWE 12 last year, and also offered multiplayer in its demo of UFC 3, which arrived three weeks before the game's launch, and it still had problems out of the box. MLB The Show, like MLB 2K has battled connection issues, drops, and latency—absolutely deadly to a game of timing like baseball. None of those really face the expectations put before NBA 2K13, most often the Frazier to FIFA's Ali as sports video gaming hits the 3/4 post for the year. NBA 2K13 will be one of the most downloaded demos, and problems in multiplayer could shade the game's launch, but I wouldn't see it affecting sales greatly. 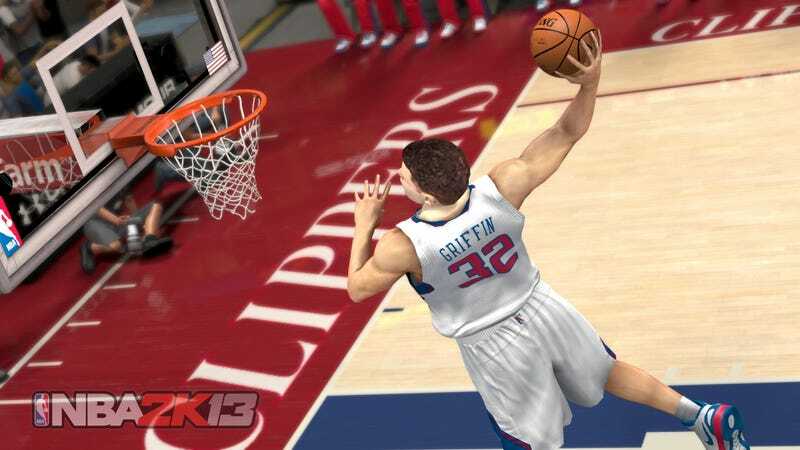 With Jay-Z aboard as an executive producer, you can expect NBA 2K13 to have a tremendous amount of celebrity support, especially over Twitter, when the game arrives Oct. 2. NBA 2K12 had terrible multiplayer problems and the drag of an NBA labor impasse when it launched and still the game showed up in the monthly top 10 of console game sales. Even the confirmed exclusion, for a second year, of the "My Crew" online team-up mode probably isn't going to dent the hype on NBA 2K13 too much. Even though Thomas, last year, said it was left out of NBA 2K12 solely because it wasn't compatible with the new codebase. It sounds, then, like they didn't try to make it compatible with NBA 2K13's codebase, either. The fact you can still have cooperative play—with NBA players—through the 3-on-3 Blacktop mode, or TeamUp (which uses real NBA teams) probably made Crew redundant, too. But this probably means the total end of My Crew, even if you have a copy of NBA 2K11 laying around (and many do, thanks to the Jordan Challenge.) Remember, NBA 2K11's multiplayer support was due to be taken offline last year, and then was given a last-minute stay because of NBA 2K12's problems. 2K Sports is not EA Sports—which itself only carries online support for the previous two editions of a sports video game. 2K will have to devote a lot of time and resources to making sure NBA 2K13's online multiplayer works right, leaving little room for past editions.